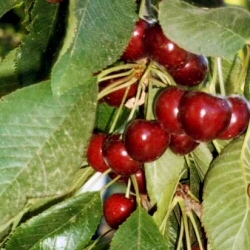 Buy Wild Cherry Tree or Gean Tree (Prunus avium) online from UK tree supplier of cell grown broadleaf hedges and shrubs. The Wild Cherry or Gean Tree (Prunus avium) is a well-known tree in Scotland, but also widely planted in other parts of Britain. Given its final height of 30m, this is a large tree, so well-suited to a large garden or part of a new native woodland planting. Distinguishing features are the smooth grey bark, which exhibits mahogany-red colouring, in time peeling and becoming deeply fissured. Attractive white cup-shaped flowers in clusters along with leaves appear in spring. Summer sees the production of masses of brilliantly coloured red -black coloured cherries. The cherries are edible and if you had never tasted other cherries before you might think that compared to chewing on cardboard that they were a tasty treat. However, if you you have chewed the flesh off other large juicy cherries, then you might consider these a little disappointing. The scrounging, free loading birds who have never held down a job in their life, will appreciate the free food in your garden and strip the tree in an afternoon or two. Typically, Wild Cherry or Gean is planted in groups of between 10 and 25 trees along the woodland edge. This number of trees is ideal for creating a wildlife habitat and a meaningful source of food and shelter. Spacing may vary between 1m and 5m. The aim is to mimic what nature intended and thus avoid artificial lines. Blending of one species into another is suggested although bearing in mind different growth rates. This tree is of primary importance as a key native species and will create an important food source for a number of avian species.